← How is the Mohawk-Hudson Trail Doing? Eighteen happy riders – ranging in age from six on up – headed out from the Lark St. Daily Grind Café at 10:30 AM on the eve of Tropical Storm Irene. 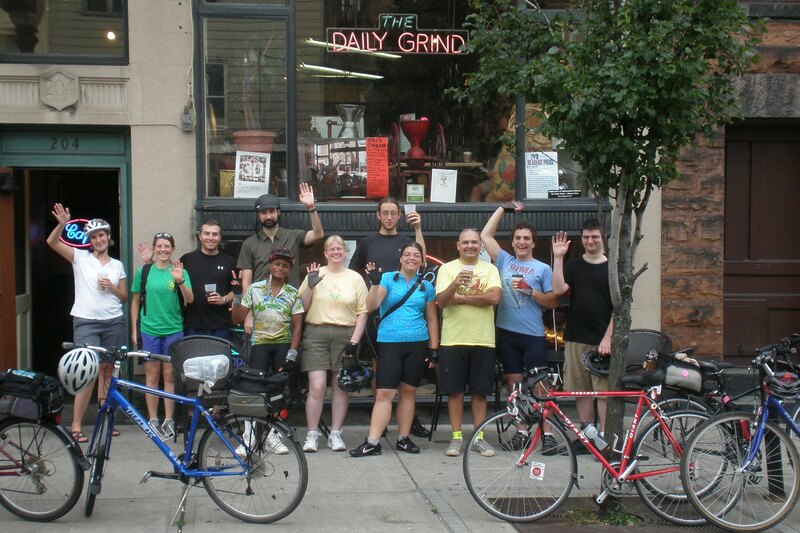 It was a beautiful day and commemorated the fifth consecutive year that the Daily Grind Café has sponsored this enjoyable Albany Bicycle Coalition ride from Albany to Troy. Our one-way distance along the Mohawk-Hudson Bike-Hike Trail and the streets of Watervliet and Troy was 9.6 miles at a lightening clip of 8.7 mph. Once settled in at the 3rd St. Troy shop, we enjoyed a variety of beverages and luncheon items generously hosted by the Daily Grind. After lunch, the majority of the riders walked a block over to the world-famous Troy Farmers Market to check out the edibles and several riders stocked up. Our riders were Ethan, Kathleen, Chris, J.P., Willow, Sam, Jill, Bert, John, Jackie, Toni, Stacy, Margaret, Ken, Dan, William, Kent, and Lorenz.